AUSTIN – Charlie Kirk came to the University of Texas-Austin last week to invite students to debate him in person. Not all of them wanted the debate to happen. The Turning Point USA founder and president wasn’t originally scheduled to speak in Austin, as he had already planned an Oct. 24 event with fellow TPUSA leader Candace Owens at Texas State University. After a video of student protesters ripping up signs on UT’s campus went viral, however, Kirk decided to make a solo appearance before his talk at Texas State. Student protesters gathered to oppose Kirk’s impromptu debates with students on UT’s West Mall, setting up right across from his booth. They chanted so loudly that it was difficult for Kirk to engage in conversations with his critics. Unknown vandals also tore down authorized TPUSA posters for Kirk’s event and replaced them with unauthorized anti-Kirk posters, according to the group. While a TPUSA official initially told The College Fix the public university required it to pay security fees, he clarified more than a week later that the group simply expected the university to charge it. The organization Kirk founded is six years old, but its UT chapter is less than two months old and was using last week’s event to grow its membership. Kirk asked students who approached him to suggest a topic, such as healthcare and President Trump’s economic stewardship, and he would explain the conservative viewpoint. About 20 students engaged with Kirk over a couple hours, though the total crowd was larger. One of the protesters stood at the edge of the crowd, attempting to draw passers-by away from Kirk’s booth. He attempted to counter any talking point that Kirk was discussing, and would occasionally shout to the entire crowd that they should ignore Kirk. Several guards and campus police officers surrounded the perimeter of the open forum, which is unusual for an event held by a campus organization, though Kirk has a higher profile than other speakers. Turning Point Central Regional Manager Ben Larrabee told The Fix the day of the event the heavy security presence wasn’t the group’s choice. “We had originally planned to have Charlie come to East Mall, but after our event was deemed high risk by the administration, we had to move it to the more cramped West Mall,” Larrabee said. The university will send the student organizers a “small bill,” about $100, for the labor and delivery around the six tables and 10 folding chairs they requested. This is “standard practice for all events requesting the use of university tables and chairs,” Bird said. Because of what happened at a recent event, the university felt that a significant police presence was important for the Turning Point USA event to ensure the protection of the speaker and protection of an atmosphere conducive to freedom of speech, which was accomplished. Even Turning Point USA recognized the need for security, since they proposed bringing their own security onto campus. 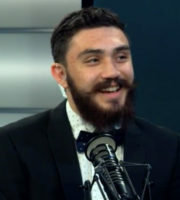 Bird emphasized that Kirk was “able to engage freely in civil debate and dialogue with individual students.” Protesters also “engaged in free speech, exercising their constitutional rights,” with the exception of one student who was “swiftly escorted” away by university police after “throwing water” at a TPUSA employee. That incident was caught on video (below). Hostilities arose briefly when an unnamed student splashed a container of water on a cameraman affiliated with TPUSA in an apparent attempt to damage the camera equipment. Campus police immediately stepped in and apprehended the student. That antagonist received a class C misdemeanor for assault, according to the Daily Texan. Free speech of UT community members is fully protected on campus. Violence and threats are not; they violate university policy and state law. You are able to discuss, argue and condemn those views you disagree with, but unwelcome physical contact with those who espouse them or the destruction of property is never acceptable. The Fix asked TPUSA media relations Friday to provide documentation for Larrabee’s claim that the university charged a security fee, after being unable to reach Larrabee for more details. He responded Friday afternoon, saying that TPUSA was “expecting” to be charged for security the day of the event. “However, it was not until after the event was over that we learned that the University was not going to apply a security fee,” Larrabee wrote in an email. UT authorities did not help the chapter deal with anti-Kirk posters that appeared around campus, according to Larrabee. “We paid for posters and the permission to put them up around campus in the designated areas for student organizations, and they were almost all torn down and replaced with anti-Charlie ones,” he said. These new posters weren’t put up by an identified student organization, which is “technically” vandalism at UT, “although that doesn’t mean the administration will help out or investigate” the anonymous acts. Some of these posters remain up on UT’s campus, and new ones popped up in newspaper stands (left) and on light posts at crosswalks (below) this past weekend. 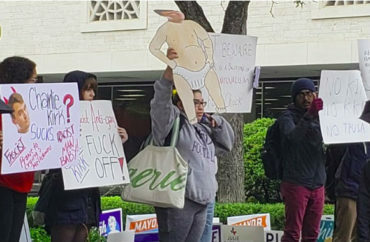 The protests against Kirk’s event were similar to those against the Young Conservatives of Texas when the group tabled on the West Mall earlier in October, holding signs that supported the confirmation of then-Supreme Court nominee Brett Kavanaugh. UT students have seemingly contradictory views on free speech, according to a survey of more than 400 through the college polling app College Pulse, which is currently polling the question nationally. In a report Wednesday, the Daily said nearly six in 10 UT students think free speech is “secure” on campus, and more than eight in 10 agree their peers and administrators value free speech. Yet eight in 10 also believe the campus climate “prevents some people from saying what they believe because others might find it offensive.” About half believe the administration “has the right to prohibit certain kinds of speech, especially ‘hate speech.’” Many of the Kirk protesters accused him of such speech. CORRECTION: The University of Texas-Austin denied that it imposed a security fee on the Kirk event after this article was published Friday morning. The TPUSA staffer who made the initial claim also corrected himself in an email Friday afternoon, saying the group had expected to be charged but never received a bill. The article has been amended accordingly.